At Everything Dinosaur we field the myriad of questions about dinosaurs and prehistoric animals as best we can. 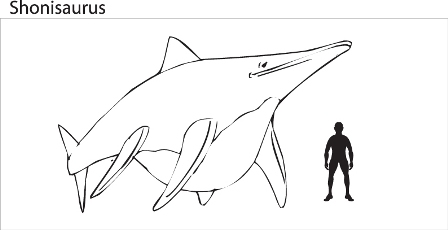 One emailer asked which was the biggest Ichthyosaur of all time? An interesting question, there are certainly a number of contenders, for example the Triassic Ichthyosaur Cymbospondylus at over ten metres long is worth consideration. Fossils of this apex predator have been found in North America and Europe. A streamlined predator, this animal hunted fish, cephalopods and probably other marine reptiles. Cymbospondylus fossils date from around 240 million years to approximately 210 million years ago. The name means “boat vertebrae”. Larger still, was the Late Triassic Shonisaurus (S. popularis), not to be confused with the Jurassic Sauropod from China Shunosaurus (Shunosaurus lii). The first fossils of Shonisaurus, this giant marine reptile were found by miners around the now deserted mining town of Berlin, Nevada in North America. The fossils were so plentiful that miners used them to decorate their dwellings and some of the large, flat vertebrae were even used as dinner plates! Reports of these fossils had been made from as early as 1869 but the miners were too busy digging for gold and silver to worry. Shonisaurus popularis is the largest Ichthyosaur to have been discovered to date in the United States and was believed to be the biggest in the world until fossils of a new species of Ichthyosaur over 23 metres long were unearthed in Canada.